SSN Verification is a fundamental service in the comprehensive background screen. Used to verify identity, DOB, Death Master Index, address history and various other tidbits, the SSN Verification confirms the information you will use to uncover criminal records and verify employment or educational achievement. A SSN mismatch is undoubtedly upsetting – and inevitable if you hire enough employees. Did the employee lie? Did you uncover a stolen identity? Was it just a typo? It was 1938. Vice President and Treasurer of E.H. Ferree Company, Douglas Patterson, is trying to market their new wallets to department stores throughout the US. His idea to use a Social Security card (to demonstrate how well it fits into the wallet) resulted in one of the most stolen SSN of all time. 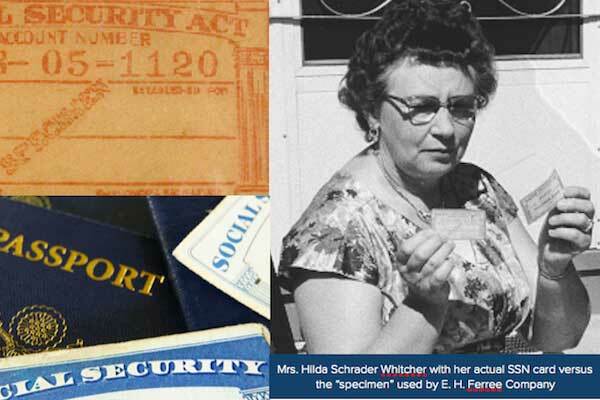 The sample card was labeled specimen and printed in red, not blue, but it also had his secretary Hilda Scrader Whitcher’s actual SSN… and was placed in each wallet. According to the SSA, SSN 078-05-1120, which is now a retired number, has been used by over 40,000 people. And, “As late as 1977, 12 people were found to still be using the SSN card ‘issued by Woolworth’.” In this same SSA archive document, Mrs. Whitcher recalled that people thought the card in the wallet was their own, so they went on using it. Employers will run into a SSN mismatch through pre-employment background screening at some point. It is important to have a clear policy in place so those running the background check approach the situation in a consistent, non-discriminatory manner. DO NOT take adverse action solely based on a SSN Mismatch. Due to the type of information in a SSN Verification, employers are prohibited by the FCRA to not hire, promote, transfer or continue employment based only on the results of a SSN Verification. DO NOT preemptively run the applicant through E-Verify “just to check”. E-Verify can only be used according to purposes specified in your Memorandum of Understanding with USCIS and in conjunction with Form I-9. In fact, USCIS explicitly prohibits the use of E-Verify for background screening purposes. Double check that the number and other personal information was entered correctly. Ask to see a state-issued ID to verify the applicant’s info (this isn’t Form I-9, so you can ask). Inform the applicant of the discrepancy and verify all information was entered correctly. Provide the applicant with a copy of the report to confirm the info. If the SSN is correct, the applicant can explore possible identity theft or other causes for a mismatch. The SSN Verification is key to confirming identity and is a best practice for pre-employment background screening. In addition, the address history provided in this service facilitates a comprehensive criminal background check. Stolen Social Security Numbers are not overly common in relation to numbers that aren’t. Only about a dozen exceptional cases have been documented with the SSA although not one matches the extent of Mrs. Whitcher. Mismatches can be frustrating for an employer and scary for an applicant. But, with the right process on how to handle a mismatch, your team can go on to make informed hiring decisions! Do you have questions about SSN Verification, Address History or other Employment Background Screening services?